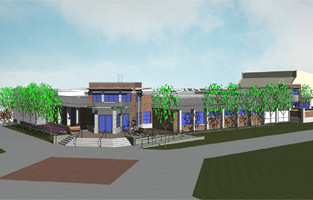 The Building 7 Renovation project consisted of the renovation of an existing 31,679 square foot space that will house the faculty and staff, a new student health clinic, the campus IT and media departments, as well as general classroom space. The total project cost was $10,757,000. ALLWEST provided inspections of soil density testing, reinforcing steel, monitoring placement of concrete testing for strength, slump, air, entrainment yield, and unit weight. ALLWESTinspected structural steel welding and bolting for the project by and AWS certified welding inspector. Full penetration welds were inspected by ultrasonic testing by a level II non-destructive inspector.